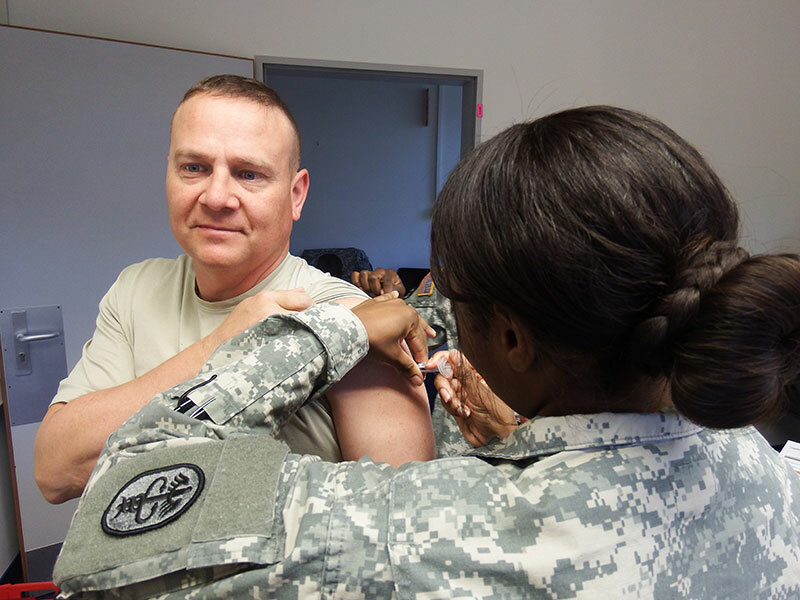 Col. David Richardson, commander of the Bavaria Health Command, receives his immunization. Health clinics in Vilseck, Grafenwoehr and Hohenfels now have flu shots and flu mist (nasal spray) available for beneficiaries. VILSECK, Germany – Coughing, sneezing, fever, aches… Flu season is here. It’s the time of year you can expect to notice more of these symptoms in your family, friends, or coworkers. But it doesn’t have to be that way. The flu vaccination is now available at all Bavaria Health Command clinics, and medical experts say the best protection against the flu virus is to get vaccinated. Health clinics in Vilseck, Grafenwoehr and Hohenfels now have flu shots and flu mist (nasal spray) available for beneficiaries. Some clinics are already offering walk-in flu vaccinations during business hours. Check with your local clinic for specific information on when and where you can get vaccinated in your community. You will be screened on-site to determine the best vaccination for you, based on your individual healthcare needs. Active duty will be vaccinated with their unit, and DODEA students can be vaccinated at school. The flu virus is constantly changing. Medical experts recommend a flu vaccine for everyone 6 months of age and older, every year. According to the Centers for Disease Control and Prevention, even though the flu virus changes each year, the flu vaccine is designed to protect against the main flu viruses that research suggests will cause the most illness during the upcoming flu season. Experts recommend you should get vaccinated as soon as the vaccine becomes available, since it takes about two weeks for the antibodies to develop in your body to fully protect against the flu. It’s important to get a flu vaccine every season, even if you got a vaccine last year. It’s especially important for high-risk patients to get vaccinated. The high-risk category includes those who are age 65 or older, pregnant women, and children younger than five, but especially younger than two. Additionally, people with asthma, diabetes, heart disease, cancer, HIV or AIDS, or those who have had a stroke are also considered high-risk and should get a flu vaccination as soon as possible. Even healthy people need a flu vaccine: Influenza is a contagious disease which affects the lungs and can lead to serious illness, including pneumonia. Yes, even healthy people can get sick enough to miss work or school for a significant amount of days, or even be hospitalized. Is the flu vaccine safe? Yes. The flu vaccine is safe. They have been given to hundreds of millions of people for more than 50 years and have a very good safety record. In addition, the flu vaccine cannot cause flu illness – however, it can cause mild side effects that may be mistaken for the flu. For example, people vaccinated with the flu shot may feel achy and have a sore arm where the shot was given. People vaccinated with the nasal spray may have a stuffy nose and sore throat. These side effects are not the flu. If experienced at all, these effects are usually mild and last only 1-2 days. Influenza can be serious – even if you bounce back quickly from illness, others around you may not be so lucky. Don’t be the one spreading flu to those you care about!